Cattle Water During Winter Grazing - Let Them Eat Snow! Cattle are perfectly capable of getting all their cattle water requirements by eating snow in their winter pastures. Like wild grazing species like deer or bison, cattle are perfectly adapted to eating snow. 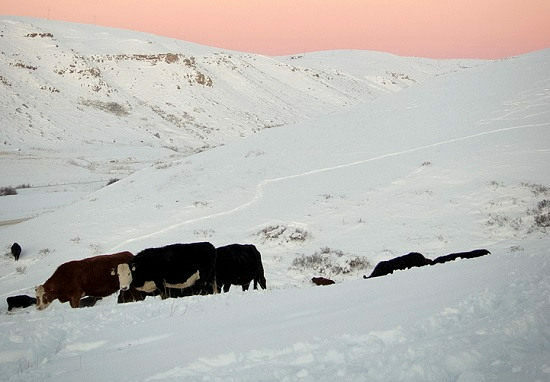 Training your cattle eat snow as their source of livestock water is simply a matter of preparing the right winter grazing conditions to encourage your cattle to voluntarily make the switch themselves. In a well-planned winter grazing program, cattle will naturally switch to eating snow as their walk to cattle water becomes more tedious. Eating snow is actually healthier for your cattle than drinking cold water during the winter, and it's so much easier on farmers than struggling to keep water lines thawed all winter. Before I go on to explain how to set up your winter pasture rotation so it will naturally encourage your cattle to switch to eating snow, it's important to explain how eating snow affects cattle health. Eating snow as a source of cattle water is healthier than drinking cold water because eating snow forces the cattle to fill up on water slowly, melting single mouthfuls at a time. On the other hand, when cattle drink their fill of cold water during cold weather they are placing a large mass of cold water into their stomachs all at once. This cold water will nearly instantly chill the cattle's core body temperature, making them more vulnerable to disease pressure. It takes a long time to warm up such a large quantity of cold water. In the meantime, the cattle are chilled. And it takes a great deal of energy for the cattle to regain their normal body temperatures after a big cold drink. It's quite common to see cattle standing in the pasture shivering after filling their belly full of cold water from the water trough during cold weather. Melting mouthfuls of snow won't affect the cattle's core body temperature. You won't see a cow shivering after eating snow. Walking back and forth to livestock waters also uses up valuable energy. Cattle that can get all their water needs from the snow right in the pasture under their feet will save energy. Eating snow also keeps your cattle away from icy or muddy water sites where injuries from slipping are a constant risk. Keeping your cattle away from central winterized water sites during the winter keeps your manure out on the pasture where it will be beneficial in the next growing season. This has the added benefit of keeping your cattle away from the manure concentrations that build up around water sites where there is a much higher risk of disease transmission. Eating snow also keeps cattle away from soiled puddles that often are found near centralized winter water sites, which tempt impatient cattle to have a very unclean drink because they're too impatient to wait their turn at the frost-free livestock water. And melting mouthfuls of snow is time consuming, which gives the cattle something to keep them occupied while they aren't rotational grazing or ruminating or sleeping. Cattle on pasture have no shortage of spare time to fill. 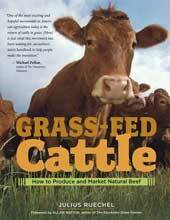 Bored cattle will walk all over their pasture, nosing about aimlessly, as their hooves permanently destroy valuable pasture grass underfoot. Encourage cattle to switch to eating snow - never force them. It is quite easy to train cattle to start eating snow. Never force them by shutting off their cattle water - simply make their walk back to water so tedious that they will eventually elect to simply begin eating snow all on their own. Simply grazing progressively further from the winterized water trough encourages the cattle to start filling up on snow. Cattle are quite lazy, after all. When is it safe to turn off the cattle water trough? Cattle will naturally switch to eating snow for drinking water as their winter pasture rotation takes them further from their frost-proof livestock waterers. You'll know when your cattle have switched to eating snow by monitoring the tracks from the winter pasture back to the water trough. There will be less and less fresh tracks each day until eventually the fresh tracks will disappear altogether. After a few days without fresh tracks you'll know the entire herd has switched to eating snow and you will be able to turn off the winterized water trough altogether and close the back fence to restrict them to their daily grazing slice. A word of caution about turning off the cattle water trough too soon... when cattle are rotational grazing through a snow cover, they ingest quite a lot of snow along with the grass. This means that their water requirements are significantly lower than at other times of the year. Even though they may not yet have fully switched to eating snow for their remaining drinking water needs, they may only need to drink every few days. To make 100% sure that all the cattle have switched to eating snow, I personally like to wait at least a week after the last fresh tracks appear at the waterer before I risk turning off the frost-proof troughs and close the gate to block access. And after the switch, keep an eye on the cattle behaviour outside of their grazing sessions. If the cattle bed down to ruminate, all is well, but if the cattle show signs of distress and hang around the gate that previously led to water, then you've turned off the water too soon and need to re-open access back to the water trough. Before moving on to the next topic, just a quick reminder to farmers who use energy-free livestock waterers as their source of cattle water during the winter season. These energy-free cattle waterers are heavily insulated and often have a ball float that the cattle have to push aside to reach the water below. They rely on the water temperature to stay ice-free, but this means that the water needs to be changed frequently in order to prevent freezing. That's why they are sized for a minimum number of cattle (i.e. 20-cattle size, 50, 100, etc.) They are a wonderful piece of technology. However, as your cattle switch to eating snow, the number of cattle drinking will decrease and the time between drinks will increase so that the water in the energy-free livestock waterer may not be refreshed often enough to keep it from freezing. Keep an eye on your energy-free livestock waterers while your cattle are switching to eating snow - you may need to manually refresh the water in your energy-free cattle water troughs a couple of times a day to keep them from freezing. Even cattle in winter feeding programs often switch to eating snow if they have access to fresh snow and a long walk to the water site. Many farmers are caught by surprise as their energy-free troughs freeze up simply because the cattle have switched to eating snow for some or all of their drinking water needs without the farmer realizing that the cattle have made this switch. If you want your cattle to eat snow for their livestock water needs, it needs to be clean, undisturbed snow. Clean snow ensures that the cattle are not ingesting disease bacteria. A daily winter pasture ensures that your cattle have access to fresh snow every day. But if rotational grazing slices last longer than a single day, cattle will need to eat snow that has been disturbed and grazed through in the cattle's search for grass. This increases the risk of the cattle ingesting manure mixed into the snow, which significantly increases their disease risk. Dirty snow carries the same risk as letting cattle drink from dirty manure-laden mud puddles. Undisturbed snow is also important. Once snow is disturbed, it re-crystallizes and becomes hard like concrete in only a few hours time. Once snow hardens, the cattle will either hurt their gums as they try to eat enough snow or they simply won't be able to find enough easily-accessible snow to meet their cattle water requirements. A daily winter grazing rotation ensures that the cattle always have access to fresh snow, every single day. Once the cattle have switched to grazing snow, it is important to monitor the snow crust to ensure that they are able to easily get access to snow. If you get a bad freeze-thaw cycle, it may become difficult for the cattle to eat enough snow, or they may injure their gums in their efforts to scrape snow together. As long as the grass is tall enough to keep the solar wicking process intact, the cattle will be able to keep grazing because the solar wicking causes the snow around the protruding grass to stay soft. But if the grass becomes covered over, the grass and fresh snow may get locked out of reach below a hard ice crust. A quick test to see if the snow crust is still loose enough for drinking and grazing is to stand on top of the snow in your winter pastures. Even if there is a snow crust, if you step anywhere near protruding grass you should instantly break through and the snow should have a loose consistency, like sugar crystals. But if you can stand on the snow even where the grass protrudes through the snow crust, or only break through with effort, then the cattle can neither successfully graze nor eat enough snow for their water needs. That's when it's time to break into the hay reserves and turn the water trough back on. Cattle behaviour is also a vital clue. If the cattle are calmly grazing through the snow and sweeping the snow crust aside with their heads to access the grass underneath, then all is well. But if large patches of snow-covered grass are left untouched, if the cattle's noses, mouths, or faces become raw from working through hard snow, or if their behaviour indicates that they are distressed, then it's time to reassess if your snow crust is inhibiting their ability to graze and to eat enough snow for their drinking water needs. Re-open access to water and turn the livestock waterer back on in early spring before most of the snow has melted. It's easy to forget after many months of rotational grazing through snow without a water trough in sight. Easy access to a water trough during the spring thaw also reduces the temptation to drink from soiled or muddy puddles that form throughout the pastures during the spring thaw. It's a good idea to plan your winter grazing rotation to be back near your frost-proof waterers near the end of the winter grazing season when snow crusting or an early melt may become a problem. This also ensures that the distance to water is greatest during mid-winter when the snow is most suited to letting your cattle eat it for their cattle water needs. Cattle water options for the winter grazing season. Or, browse through more articles about Rotational Grazing on the Grazing Strategies main page.